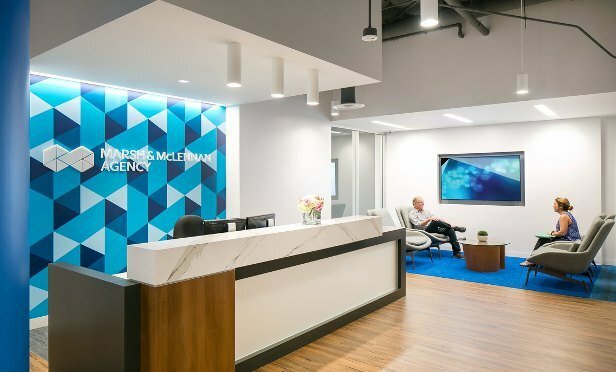 The trend toward more dynamic offices isn’t just for creative and tech firms, as demonstrated by Ware Malcomb’s redux of Marsh & McLennan Insurance Agency’s new Orange County office here. A custom wall covering behind the reception desk in Marsh & McLennan Insurance Agency’s remodeled space is based on the corporate logo. ALISO VIEJO, CA—As we’ve been hearing more and more from the office sector, the trend toward more dynamic offices isn’t just for creative and tech firms. This is demonstrated by Ware Malcomb’s recently completed redux of Marsh & McLennan Insurance Agency’s new Orange County office at One Polaris Way here.